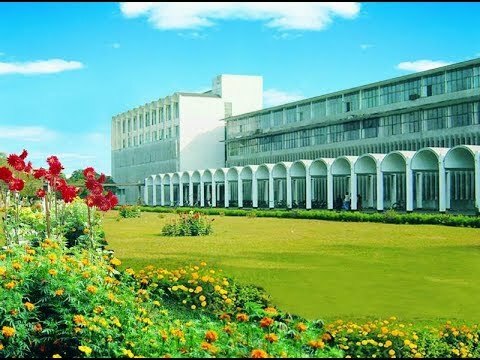 Bangladesh Agricultural University came into beings in 1961 having a total areas of 485 hectors of land. It is situated 4 km away from the district town of Mymensingh and 120 km north from the capital city of Dhaka at the western bank of the Brahamaputra. Initially it started functioning with only two faculties. At present the number of departments has been increased now 43 under six faculties. Moreover, an affiliated college, a Graduate Training Institute (GTI), a BAU Research System (BAURES), an Extension Centre (BAUEC) and thirteen residential halls under this university. The campus is made up of a series of academic, administrative and residential buildings and number of experimental farms, gardens and other related facilities. Besides, two national research institute BINA and BFRI are housed in this campus. Initially BAU started with only undergraduate students. The number of them were 444 and teachers were only 29. During the long tenure of 58 years the university has widen its spectrum and immersing M.S. (equivalent to post-graduate), and Ph.D. degree. In the season 2017-18 the enrollment of graduate students are 6201, M.S. are 1550, Ph. D scholars 360, the number of teachers 564 Officers 367 and employees are 2500 respectively.